Michelle's work over at Silver Run Ceramics has been making my heart pound for ages. She crafts these wickedly sharp foxes that double as match strikers, knotted snakes on plates and detailed animals on mugs, her artistry is truly amazing. 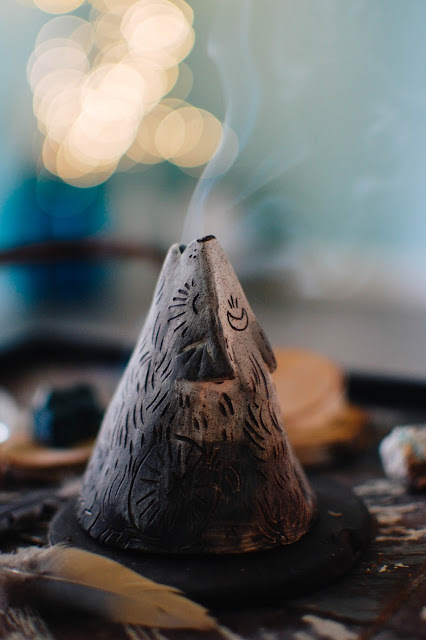 But what has had me all heart eyed from the get-go was this wolf incense burner. I mean. Look at him. Wouldja just look?! He came with a ceramic plate that has a touch of glaze in the center to make incense residue clean up easier. He lifts his head and howls skyward, letting the incense smoke stream from pursed lips. The crescent moon on the top of his head is just dreamy. He is around 3-4 inches tall and fits cone incense perfectly. 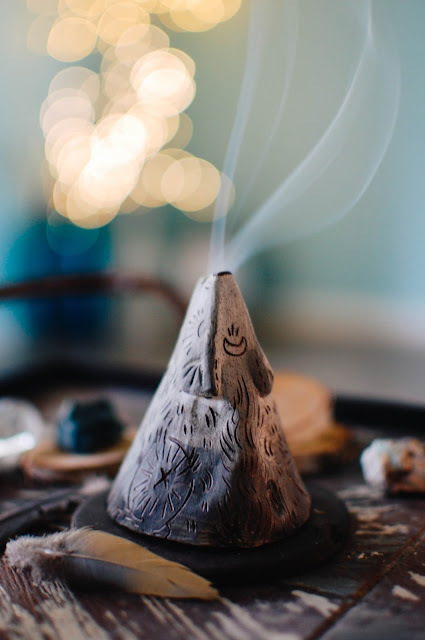 I have been using my Paine's Pinon incense cones in him and I think he likes it. I know I do. Do you have a ceramic artist you have been wanting to collect from? fabulous - I want to find one similar from them! Gorgeous wild creature. 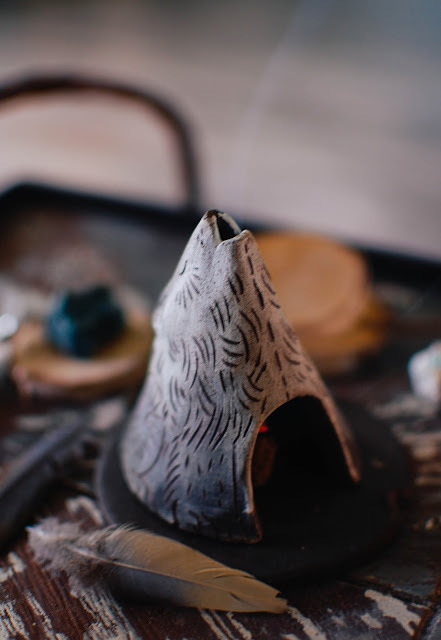 If she ever does an owl version, please message me(but nobody else, these animal incense burners are hard too catch!) Your photos are magical, trying to capture incense smoke from my camera phone was an exercise in frustration when I shared by CBE mountain burner. You say this is 3-4 inches and fits perfectly? I wish my mountain burner were slightly taller because I think the peak snuffs the cone slightly. 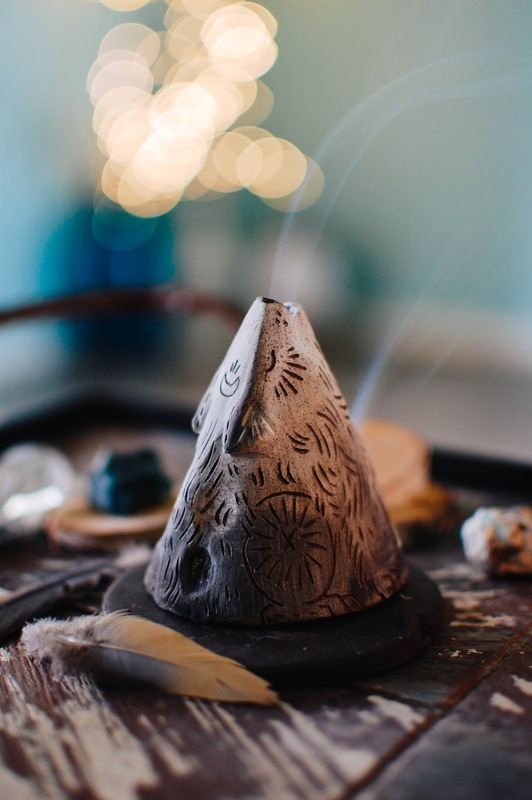 Although the thought just occurred to me, it could be because it's a Palo Santo burner design, lol. Oh well, enjoy this beauty.